At 43,663 acres Clear Lake is the largest body of water lying entirely within the borders of California. 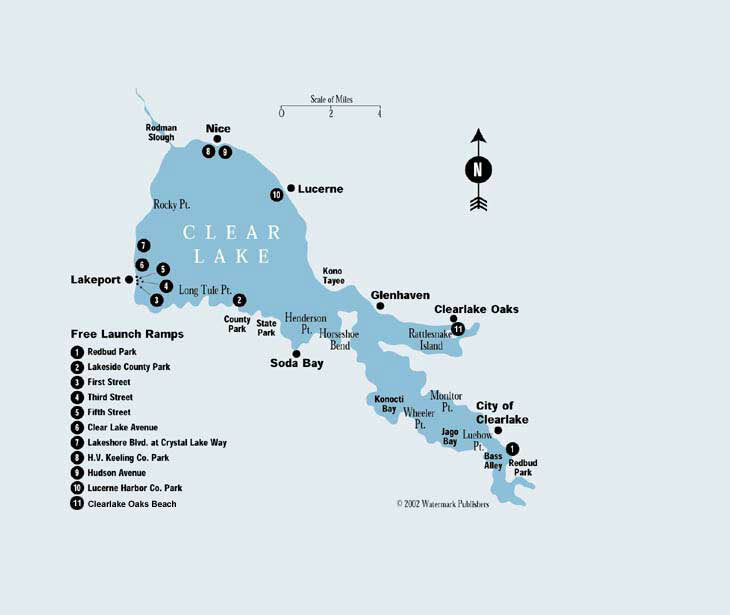 Clear Lake is shallow with an average depth of 21 feet and a maximum of 59 feet. The lake is about 18 miles long and 7 miles wide. Water levels fluctuate about 5 to 6 feet per year. This natural lake contains numerous inlets. A dam was constructed at the base of the lake in 1915 to help stabilize water levels. The dam is maintained by the Yolo County Flood Control and Water Conservation District. There are 100 miles of shoreline, much of which is privately owned. There are many docks, retaining walls, pilings and rock rip-rapped areas. Extremely fertile with clarity varying from a normal of less than 2 feet to as much as 15 feet on occasion. Heavy blooms of blue-green algae, particularly during summer, combined with suspended sediments cloud the water and limit transparency. Most of the shore is lined with docks, pilings, piers and other man-made, fish-attracting structures. Tules, large boulders, submerged brush, hydrilla and other vegetation also provide cover. Clear Lake supports an excellent largemouth bass fishery that boasts one of the highest catch rates in California. Stocking of both Florida and northern strains has produced a population characterized by quality as well as quantity. The lake record largemouth was caught in 1990 and weighed 171/2 pounds. Several fish over 10 pounds are caught each year, and fish in the 2- to 4-pound range are considered average. An excellent crappie fishery with good-size fish can also be caught. Sacramento hitch, carp, Sacramento perch, threadfin shad, Mississippi silverside, and juvenile panfish.